When fruit flies start appearing in your kitchen, it's time to take action. In this video, Northwest Florida Molly Maid franchise owner Christine Clark appears on WALA-TV-Pensacola to share the tips you need to win back your kitchen. First, reduce their presence by taking care of what's attracting them: the ripening fruit, dirty dishes (especially wine glasses and any dishes with jelly or fruit juice), sticky counters and full-of-organic-waste garbage disposal that needs to be run regularly. Then target fruit fly breeding grounds by replacing your used cleaning sponges, dish rags and mop-heads more regularly. Next, attack the flies themselves with this simple, effective trick: create an apple cider vinegar-dishwasher soap mixture in a jar to trap the insects. The sweetness attracts them like, well, flies. When you like the size of your catch, put the lid on the jar and dispose of it. Repeat as necessary until your kitchen is once again yours. Another course of action: placing a small, oscillating fan on your kitchen counter and putting it on a low setting. 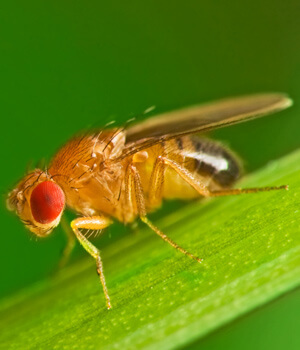 The gentle breeze coursing through your kitchen creates a miserable environment for fruit flies, and you will notice that they seem to pack up their bags for sweeter pastures. Get even more advice on keeping your microwave, refrigerator and other appliances sparkling clean. Check out these Kitchen Cleaning Tips.